Children, teenagers, adults, elderly … Do you have hard time writing or would you like to improve your writing’s readability? We can help you improve your strokes and discover a legible handwriting. The Isabelle font will help you create documents using the writing style proposed by “The Pleasure to Write Well” method. We owe this font mainly to the extraordinary work of the calligrapher Isabelle Gagné, Atelier ExpressArt.. It is in her honour that the font is named Isabelle. Subsequently, Isabelle Lapointe, computer graphics artist, vectorized all the characters so that Olivier Bérubé, the “little IT genius!” was able to create a software that works smoothly both on PC and MAC. We have decided to have an imperfect font! Thus, if you zoom a lot your characters, you will see that the contours are not perfectly smooth because we want to maintain the craftsmanship and the hand-made feel. It was also our choice to use universal typographic uppercase letter, since they represent a space of freedom where everyone can give way to their creativity. It is with great pleasure that we offer to you the Isabelle font free of charge. Download it, configure it, use it! Once the software downloaded, you will have to make small manipulations when you are in your Word processor. Open the font settings by clicking on the small arrow at the bottom right of the word Font in your toolbar. 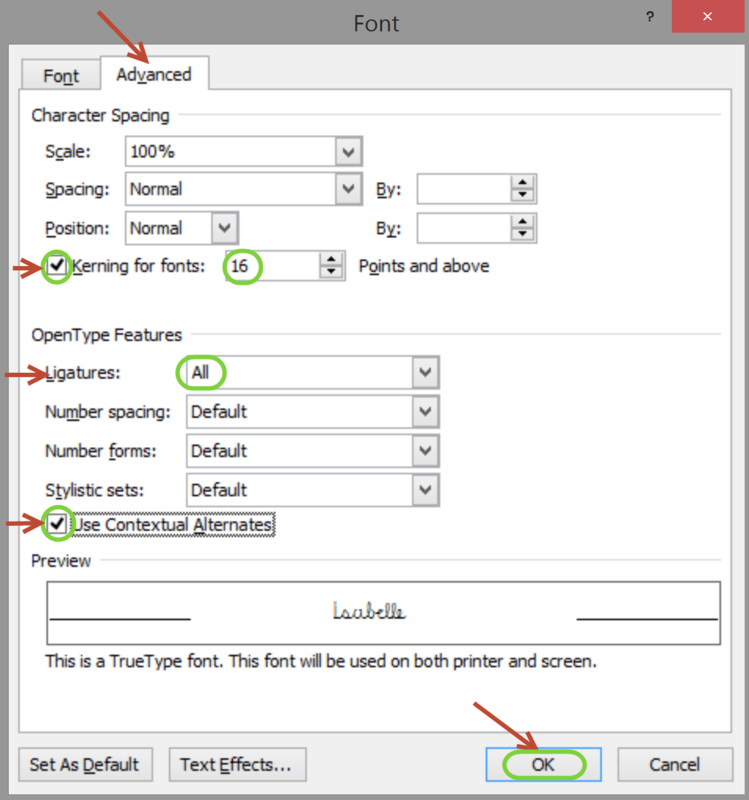 If you do not want to have to repeat the configuration process with each document creation, you can simply add the Isabelle style in Word.